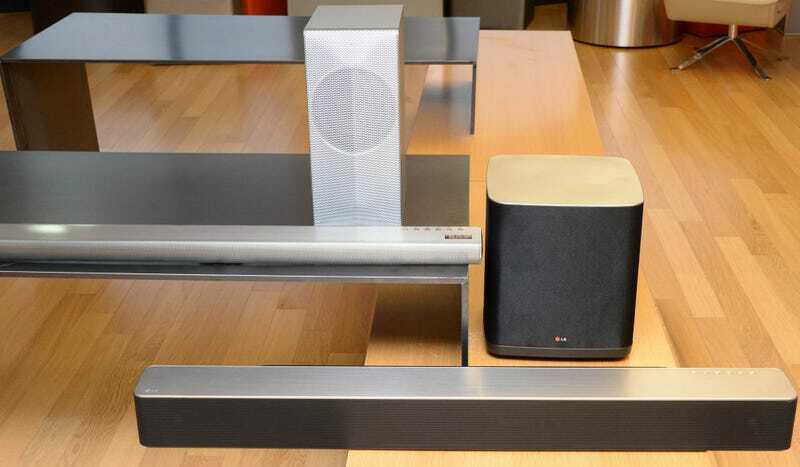 LG's new line of battery-powered, Wi-Fi enabled speakers complement their new sound bar models, sure. But they also fill out Music Flow—the company's Sonos-like connected-house audio offering—with some attractive, well-rounded hardware. Debuting at next month's CES, LG's new speaker line and soundbars are part of the company's larger Music Flow system roll out. Music Flow connects to individual devices over Wi-Fi, rather than more conventional Bluetooth connections. These ad-hoc speaker networks can then be controlled and managed via the Music Flow mobile app which will be available on both iOS and Android. The app will reportedly manage both local music content and stream it from Spotify, Rhapsody, and TuneIn. If it sounds like Sonos—or one of a few Sonos-like systems that have cropped up over the years—that's because it is. But it's also an attractive bit of gear, with a few nice extra touches. The new speakers will automatically begin playing music from the app, whenever the phone comes within a foot of it. That way, if you're listening to your mobile device as you walk through the door, all you have to do is take off your headphones and set your device next to the speaker and boom, the music keeps playing. Similarly, you can have your music follow you from room to room, simply by taking your smart phone along. The speakers also offer HomeChat, aka the ability to text your speakers with instructions, i.e. "turn off in 10 minutes" or "set alarm for 8:30 am." LG's remaining mum on the specific specs of these smart speakers—including the price—but we should be getting an in-person look in just a few weeks. We'll update when we do.